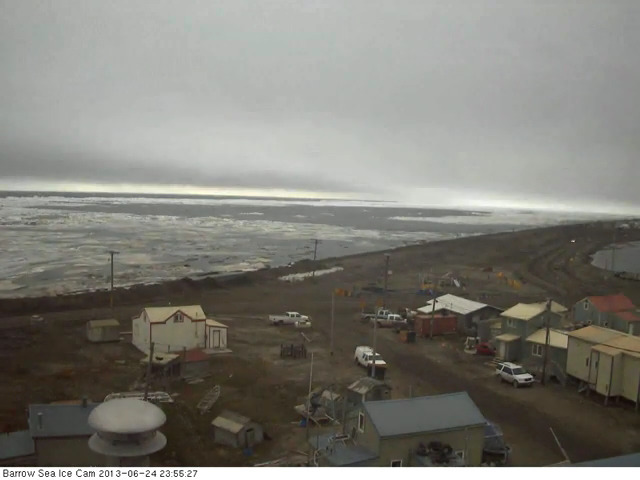 A combined early sea ice break-up in the Beaufort Sea and the influx of warm, off-shore winds has pushed the ice away from the Barrow coastline. Though unusual, open water does appear, now and then, early in the year at some Arctic locations. 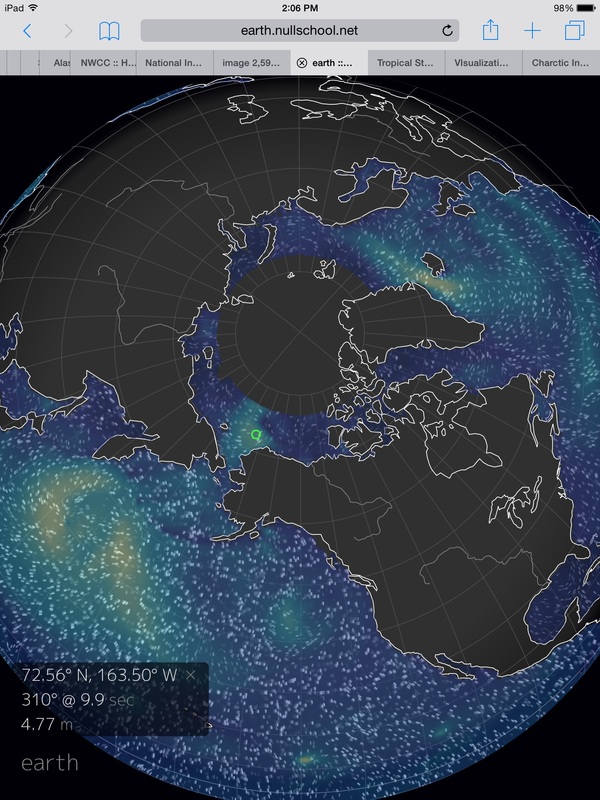 What is unusual is the apparent size of the current open water expanse off Alaska combined with major sea ice cracking events all across the Arctic Ocean. One curious point to note is that current satellite measurements appear to mark this area of ocean as ice-covered. But, as we can clearly see in the picture, the area is, except for land-stranded ice, ice-free. 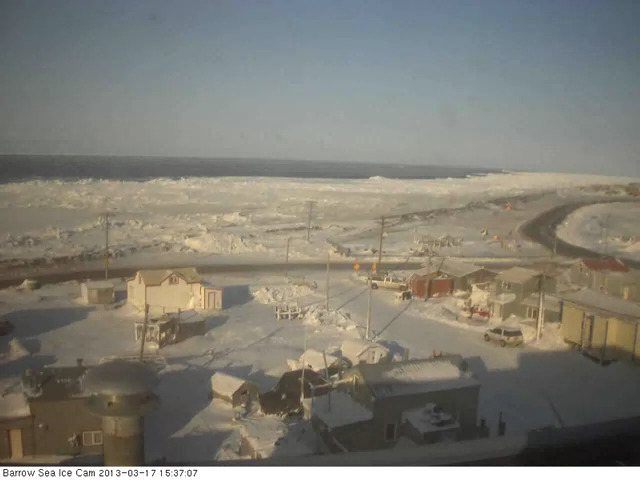 With the sun now present in Barrow for a growing portion of the day, this open area of ocean is available to absorb a greater degree of heat than a reflective ice sheet. And with so many large cracks riddling much of the Arctic, there are vast regions where darker, less reflective areas are open to more sunlight absorption. 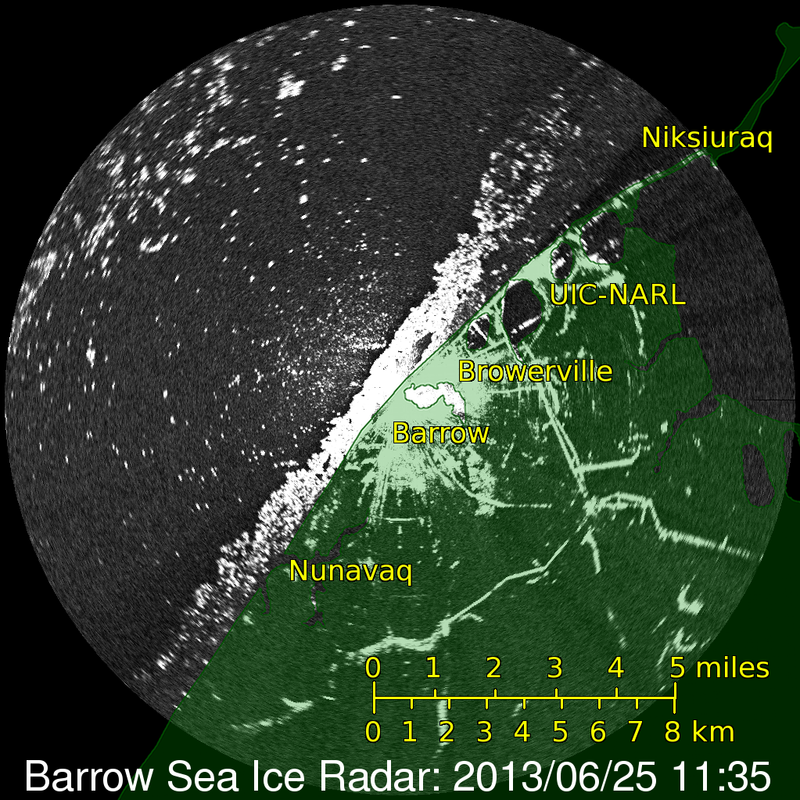 The above image shows a large region of thin ice opening up north of Barrow. But, as we can see from the Barrow sea ice cam, at least some of that region isn’t ice at all. It’s open water. If the satellite is mis-reading water as ice, then sea ice area, extent and volume measurements are somewhat lower and the melt season is taking hold to a degree not previously anticipated. This Barrow data is just one instance of a large open water area being visible on the ground where satellites are showing ice. So we have no reason to say that such an event is happening in other regions. That said, open water at Barrow adds to a long list of indicators showing that ice melt has begun in the Arctic and that this particular season may well be proceeding with a vengeance. 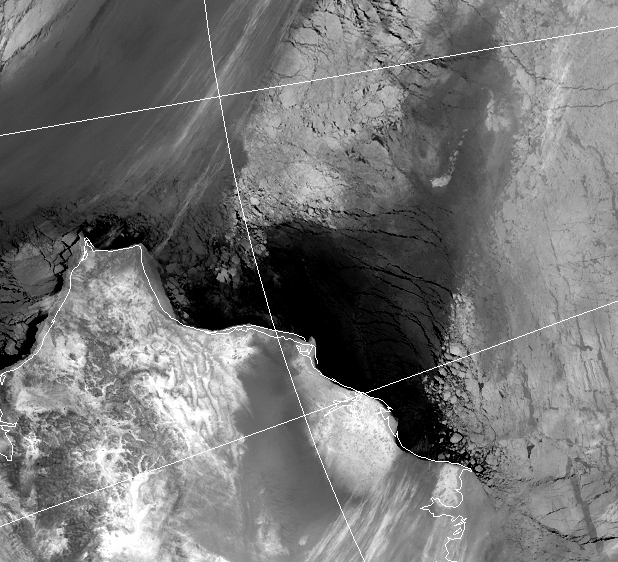 New satellite image, this one also identified by Jim Hunt, shows visible shot of open water near Barrow. In the image, you can see a large pocket of open water and adjacent areas of, very broken, sea ice. As seen in the Navy shot, it appears this melt is not yet showing up in the area or thickness models. So we’ll have to see how quick they are to respond. According to expert analysis, radar images like the one above can miss areas of very thin ice. So the appearance of open water may be exaggerated. 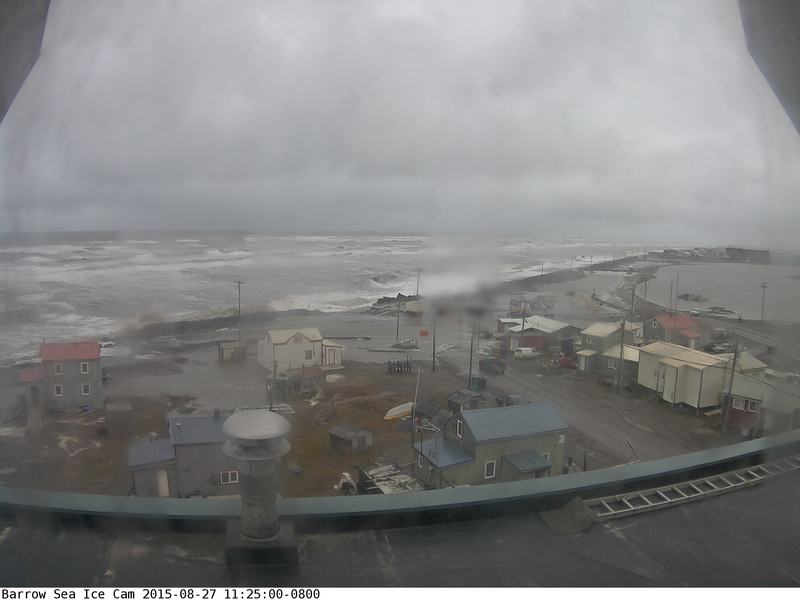 Nonetheless, as the camera shot from Barrow shows, a portion of this area is clearly open water. 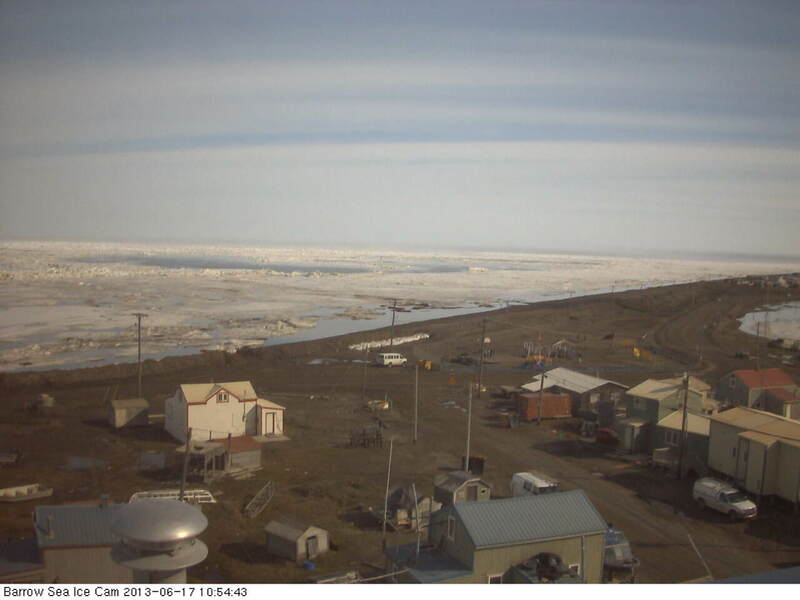 The sea ice has, once more, closed in on Barrow. As noted above, open water does appear under certain conditions from time to time during the Arctic winter and spring. These events can and do occur when air temperature is below freezing. This large open water event, however, did happen in combination with a massive cracking event that covered much of the North-American side of the Arctic Ocean. For brief periods, open water formed at Barrow and at other locations. Futhermore, thin ice now appears to be expanding in various locations from Alaska to the Canadian Arctic Archipelago. So these instances were part of an unprecedented cracking and ice shifting event during the winter/spring of 2013. In context, these events show that ice is weaker and more mobile than during a usual winter/early spring period. And with melt ramping up, these weaknesses are likely to play a prominent role in the 2013 melt season. Some are saying that there is little chance Arctic sea ice will survive the 2013 melt season. My personal opinion is that this risk is over-stated. However, there is a small chance that sea ice will completely melt by end of summer 2013 (about 10%). That said, risks for complete summer Arctic melt increase drastically during the period of 2013-2017. Under current trends, total melt of sea ice during summer occurs by 2017. That said, any single year where melt was similar to 2007 or 2010 (volume) results in an ice free state by end of summer. So we are at the start of a period of very high risk for Arctic sea ice.